Winifred Mayne arrived at Cornell College from the small northwest Iowa town of Emmetsburg and studied under fabled English Professor Clyde "Toppy" Tull. She worked to pay her way through Cornell and was virtually a member of the Tull family in addition to serving as Toppy’s secretary. 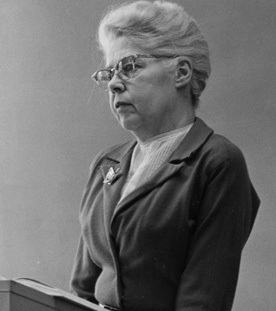 Tull encouraged her as a writer, and she published several pieces in Cornell’s literary journal of the time, The Husk. Upon graduating Phi Beta Kappa in 1925, she taught at the high school in Emmetsburg, then entered the master’s program at Columbia University. She returned from New York in 1928 as a professor in Cornell’s English department. In 1934, at the end of the academic year in which she married Ben Van Etten ’28, she left the faculty and spent the following years writing. The stunning result was "I Am the Fox," her 1936 novel that won the $10,000 Atlantic Monthly Press and Little, Brown and Company prize for "the most interesting and distinctive contribution" to their annual contest. It became a best-seller. Winifred Mayne Van Etten resumed her position in South Hall in 1937, teaching English until 1968 and editing The Husk from 1960-1967. Cornell honored Van Etten with an honorary doctor of letters degree in 1976. She died in 1983. Cornell history Professor William Heywood, in "Cornell College: A Sesquicentennial History", described Van Etten as shy and somewhat withdrawn, but with this caveat: "Behind that quiet demeanor, however, were an extremely penetrating mind and a biting sense of humor."